I'm sure you all recognise this scenario. Trays of beautiful stone fruit at the supermarket, luring you beguilingly with their rosy-tinged skins. Overwhelmed with desire for these seductive beauties, you fill a bag and scurry home in anticipation of that first tangy bite, which you take standing at the kitchen sink to catch all the juices that will be running down your chin and your arms. You raise that delicate orb to your lips, close your eyes and sink in your teeth, and .... blech ... your eyes spring open with the disappointment of floury, flabby flesh, tough skin, and complete absence of any flavour. I don't know why I keep buying stone fruit, as I am so often deeply disappointed. I know that in reality the only way to experience a beautiful peach is picked straight from the tree at perfect ripeness, but still somehow I live in hope and am lured in time and again. This summer, the fruit seems to have been even more disappointing than usual. Fortunately, such disappointing fruit can be redeemed by cooking it. I have made big batches of fruit roasted in the oven with a liberal sprinkling of vanilla sugar and a good dousing of my "44" - this makes a great dessert served with good vanilla ice cream or mascarpone, or is also beautiful for breakfast with some Greek style yoghurt and a sprinkling of nuts. I've made crumbles and cakes. Even adding a few bright, zingy flavours like chilli, lime and coriander to make a salsa can offer some vague redemption for otherwise lack-lustre fruit. This week I made a Nectarine & Plum Sponge Cake to salvage some less than perfect fruit taking up real estate in my fruit bowl. The recipe comes from Julie Biuso's book Sweet Feast. This is Julie's latest book, and is a selection of her favourite dessert recipes. This is the fourth book by Julie Biuso that I've now added to my cookbook collection, and like all the others this one does not disappoint. Everything is beautifully photographed, and the recipes are clear, easy to follow, and, most importantly, reliable. The book is divided into sections - cakes and sponges, tarts and pies, special occasions, comfort, chocolate, and festive - and at the end of each section is a really useful "cooking class" offering technical advice and hints. This recipe comes from the cakes and sponges section of the book, and although the original recipe was for little individual nectarine sponge cakes, I chose to incorporate some plums as well and made one large cake instead of individual ones. Preheat your oven to 200 degrees C (390 degrees F), regular bake. Grease and line the base and sides of a 23cm loose-bottomed or springform cake tin. Remove the stones from the fruit and cut the flesh into slices. Set aside. In a small bowl, mix the 2 tablespoons of caster sugar and cinnamon together, to make a spice sugar. Set aside. Put the butter and milk into a small saucepan, heating gently until the butter has melted. Meanwhile, break the eggs into a bowl and, using an electric mixer, beat for about 1 minute, then continue to beat constantly as you add the caster sugar one tablespoon at a time. Keep beating, until the mixture is very pale and thick - the mixture will form ribbons when you lift the beaters from the mixture, and it will have almost a mousse-like quality. Sift half the flour and baking powder mixture over the egg mixture and gently fold in with a large metal spoon. Add the rest of the flour mixture and fold in. The mixture will be quite thick. Bring the milk and butter up to a quick boil and pour it, still bubbling, over the cake batter, stirring continuously. Mix until fairly smooth, but don't worry about any small lumps. Pour the batter into the prepared cake tin. Arrange the sliced fruit over the top of the batter, and sprinkle with the spiced sugar. Bake for 30-35 minutes until golden on top and a skewer inserted into the centre of the cake comes out clean. Cool in the tin on a wire rack for 10 minutes, before removing from the tin and allowing to cool completely on the rack. Dust with icing sugar and serve with yoghurt or mascarpone. 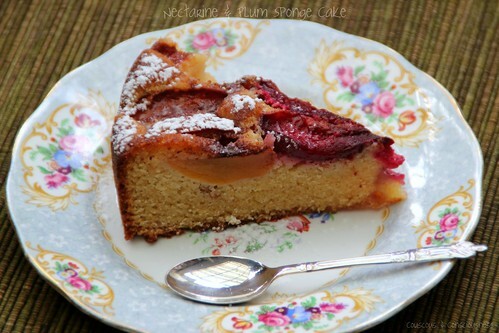 I loved this cake - it was deliciously moist, and I love the fruity tanginess when you bite into a piece of the nectarine or plum. This is a good sized cake, which makes it ideal for serving a crowd - it offers 8 generous servings, and could probably easily stretch to 10 or 12 if serving as part of a larger meal. It kept well for several days, and I actually thought it was better on day 2 than the day it was made. It was great for breakfast too. What? ... toast and jam/cake and fruit ... same/same, no different, as far as I'm concerned. End of story. I hope you'll give this a cake a try - I'm sharing it this week at Cookbook Sundays, where my friends are delving into their cookbook collections and sharing some of their recipes. 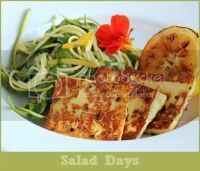 Do stop by to see what they're cooking - you might even feel inspired to link up a recipe from one of your own cookbooks. 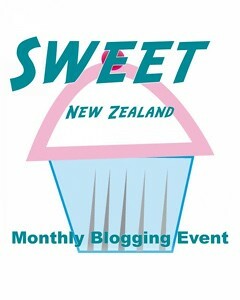 I am also sharing this post with Sweet New Zealand, a monthly blog event created by the very lovely Alessandra Zecchini, and which this month is hosted by the equally lovely and incredibly talented Shirleen at Sugar & Spice and All Things Nice. This is an opportunity for all Kiwi bloggers (whether you are living in New Zealand or overseas), as well as for non-Kiwi bloggers living in New Zealand, to connect and share some of those sweet treats from your kitchen. So, head on over to Shirleen's and share something sweet. I'm also sharing this post at Foodie Fridays hosted by Designs by Gollum, and at Gallery of Favourites hosted by April at The 21st Century Housewife. I totally agree with you about stone fruit, Sue! I dream of peaches like I used to have when I was a kid in Ontario - they always seemed so wonderfully juicy. 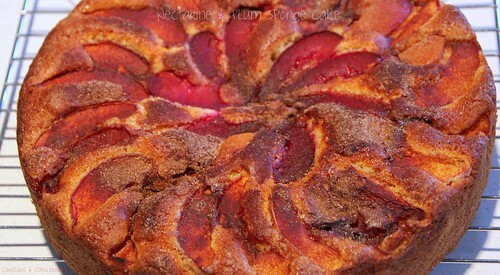 Your cake is beautiful, and I like the combination of the nectarines and plums. I'd love it if you would share it with the Gallery of Favorites I co-host with Alea. It's up on my site now if you would like to join in. I have not heard of Julie Buiso before, but I'm going to seek out her books - I think I will enjoy them! I think back to when I was a kid too, April and remember what peaches used to taste like, and that's the benchmark, from which everything else seems to fall short. But then when I think of those childhood peaches, they came from the tree in our backyard - never from the supermarket - and that's the lesson, isn't it. Julie Biuso is a New Zealand cook. She is married to an Italian and has travelled a lot around Italy, so many of her books focus on Italian and Mediterranean style food. Highly recommend her books. I will definitely share this with Gallery of Favourites. Thanks for visiting. Yes, you are right - fresh peaches always are the best! Thank you for the info about Julie Bluso and also for linking up to the Gallery. I spend most of the time with stone fruit juice dripping down my chin at this time of year. I can't get enough of them. I'm going to try this recipe with the peaches and plums I have as I know I'll never get through the pile before the rot sets in on them. I am going to try growing apricots and peaches next year in my kitchen garden in pots as it is most definitely the best way to eat them. Wow - I never would have thought of growing apricots and peaches in pots, but it's definitely worth a try. They are absolutely my favourite fruit, but really generally so disappointing if you can't get them straight off the tree. I am sorry that the fruit is disappointing this year, maybe not a good year for stone fruit in general, probably Arfi got the best of it from her trees, but the peaches I found in shops weren't good, and the ones in the supermarket ... should be illegal becasue they are so bad! But the cakes looks great and a good entry for Sweet NZ Sue, and I almost missed this post, good to find it in Time for a Little something's Friday favourite fives :-). Alessandra, I think you are right - I think the less that perfect weather in some areas this summer has not be very good for producing beautiful stone fruit. You're so right - the peaches in the supermarket should be illegal - they have been shocking, and even peaches I have bought at the market were pretty bad. Love the book. Funny, I was looking at the picture thinking 'That's late summer on a plate right there', but your points about the disappointing fruit this year are spot on - nothing beats the anticipation just before you bite into a ripe peach, or plum, or apricot, but equally nothing beats the disappointment when they turn out to be hard, woolly, or completely lacking in flavour. I'll keep this recipe in the list for next time I have a bad batch of fruit! Oh sorry that stone fruits has disappointed you, how beautifully you have turn them in cake, they looks absolutely gorgeous!